We are recognized as one of the leading Manufacturers , Wholesaler and exporters and suppliers of Lemon Quartz Chips Strings. Crystal Quartz Deco Chips are perfectly polished by our professionals using advanced methods. Offered products are widely used in aquariums and are available in market. High Quality Quartz Silica chips are available in all grades, produced as our factory in Godhra, which are used in industries as an abrasive in stone cutting & sandblasting. It is also used in oil drilling, glass grinding, fiber glass, solid surface, paint stripping, micro graving and micro blasting. Packaging: 10/25/50 kg/bag; customised packing also available. We offer high quality range of Quartz Chips. These are used in ceramics and glass.Our range is famous in the market for quality. These are used for construction work and foundry molds. These are also used as a filter for some liquids and in making sandpapers, scouring powders and whetstones. We offer our range at market leading prices. 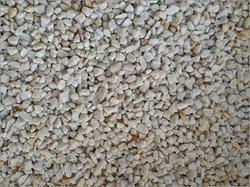 We are offering our client an excellent quality range of White Quartz Chips. 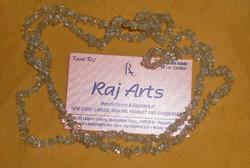 These white quartz chips are offered in variety of designs, shapes, sizes and colours. Shelf life: 6 months in unopened container. We are manufacturer of Quartz Chips (uncut) of any size. It is mostly opaque or translucent and is in wide demand in various industries. Some of the features includes uniform particle size, free flowing, free from impurities and environment friendly. Being a leader in the industry, we are engaged in offering a qualitative range of Quartz Chips to our customers. The Crystal Waves Is Located In Khambhat Historically Famous For Its Gemstone Craftmanship.